Alex Meyer posted a 3.21 ERA and 84 strikeouts in 70 innings for Double-A New Britain. Not many millionaires would willingly and enthusiastically work a side job that pays them only $63 a day, but Minnesota Twins minor league pitcher Alex Meyer isn’t like most millionaires. The former Mr. Indiana Baseball winner may earn the big bucks on the diamond, but during the offseason, he chooses to return to his hometown and serve as a substitute teacher in the Greensburg school district — more specifically, walking the halls he strolled as a teenager: Greensburg High School. The 6-foot-9, first-round pick out of the University of Kentucky certainly doesn’t have to spend his winters telling high schoolers to stop texting, but Meyer enjoys knowing he has a second love that could turn into a career if baseball doesn’t pan out. "Being able to be a substitute teacher puts me in a real-life atmosphere and lets me know if this is something I really want to do or not," he said. "So far, it is." According to David Woods of the Indianapolis Star, the 23-year-old has worked as a substitute teacher for the past three offseasons, despite having signed a $2 million contract with the Washington Nationals in 2011. 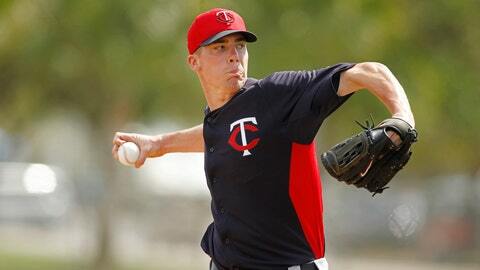 Meyer was dealt to the Minnesota Twins in 2012 and instantly was ranked as the organization’s fourth-best overall prospect by Baseball America. Meyer lived up to the hype, posting a 3.21 ERA and 84 strikeouts in 70 innings for Double-A New Britain. He’s predicted to make his major league debut in 2014, and although his future looks bright, he’ll continue to spend half the year working on his curveball and the other half working on chemistry. "Hopefully, I’m able to play baseball and have a nice, long career," Meyer said. "But you never know what’s going to happen with that. So you’ve always got to be able to have something on the ready."